Over the last month I've taken part in a really fun Tunisian Crochet-along with the Crochet Circle Podcast and after completing a first project decided to squeeze in a second one before the deadline. 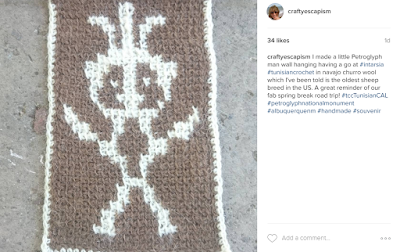 I tried out Intarsia Tunisian Crochet making a petroglyph man that we spotted at Petroglyph National Monument in Albuquerque, New Mexico. Here is the design inspiration. I know he doesn't have legs but I took artistic liberties and gave him some. 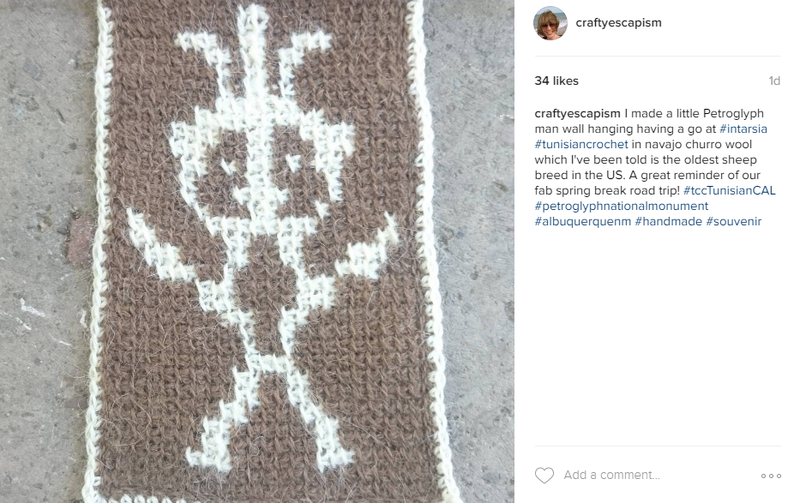 I could have drawn a chart free-hand to make my petroglyph man but I wanted to get his dimensions right so I used the rather amazing free Stitch Fiddle online tool, uploading the photo to make my own chart. Love it! Stitch Fiddle allows designers to create knitting, cross stitch and crochet charts. For crochet there are three options: colored charts, filet crochet and free form with crochet symbols. I've written charts with symbols before from written patterns for students who prefer them. Now I can do this far more easily. If you want to design Tapestry Crochet or Graphghans I can see Stitch Fiddle being incredibly useful too! I like my books for a general intro and then I search for a video of the specific technique. The most useful video I found was Tunisian Simple Stitch Intarsia by BethinTX1 (I've subscribed to her channel). Beth is a really talented lady and I like her even more because she's in Texas like me!! Here is my petroglyph man. My yarn is fluffy navajo churro and my design looks a little rustic and I'm fine with that. I've figured out the technique and made him into a little wall hanging with tassels as a homemade holiday souvenir. For further details of the CAL, read my blog post Ten Tunisian Crochet Tips, search for #tccTunisianCal on Instagram and see the finished objects thread on the Crochet Circle Podcast Ravelry group. Can't wait for the next new technique!